It's mid August and the summer heat has finally hit us here up in the mountains, where you need room heating about three quarters of a year. Still, nothing compared to what I survived in Tokyo every year for most of my life, but even here it can get hotter than I'd rather like every now and then. And I find myself swapping a glass of something cold (or lukewarm) for a warm cup of tea that I usually drink throughout the day on any given day. That's often cold-brew sencha (green tea) or genmaicha (roasted brown rice tea, with some matcha to it), or just plain water. But for the past week or two I've been experimenting with something a little different - like this chamomile mint water with cardamom, for instance. It's basically just water infused with dried chamomile flowers (home-dried ones here), sprigs of fresh mint (one of the very few herbs that do well in our garden), and lightly crushed cardamom pods. The whole thing sits in the fridge for about 24 hours to impart the flavor of the herbs and spice to the water. You could just call this chamomile mint tea, I suppose, but the way how the flavor is so very subtle makes me see it as more of water than tea. Or more precisely, more of a substitute for plain water than a type of tea. It's completely subjective, but that's that. As for this particular combination of chamomile, mint and cardamom, I stumbled across it in this book on flavored waters (in Japanese) while I was browsing a bookstore in town a while ago. It featured dozens of interesting-sounding flavored waters using a variety of fruits, vegetables, herbs and/or spices, both sweetened and unsweetened. And this recipe was the one that caught my eye and I tried it as soon as I got home. I'm not necessarily a big fan of regular chamomile tea prepared with dried flowers (or mint tea with dried mint, actually), but this proved to be a really light, refreshing concoction, with cardamom adding a zing to it. And serve chilled, perhaps with ice. This particular one comes from a recipe I found here as I searched for more ideas for infused water. Whatever you use, the nuts and bolts are simple: combine water with fruits/vegetables/herbs/spices, let it steep in the fridge overnight or longer, and serve chilled. 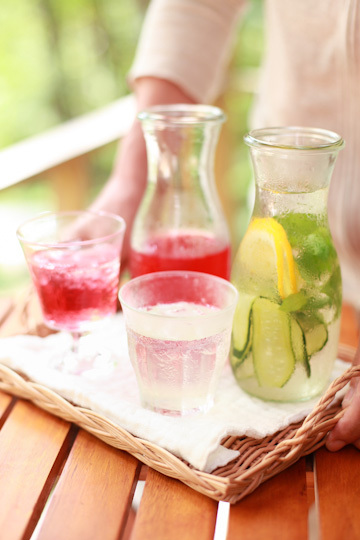 That said, once you've started looking for recipes for homemade flavored waters, you'll notice that there are a few different routes you can take to flavor your water, along with a whole lot of different flavor choices. You can sweeten or not sweeten it; cook the fruit or not; puree the mixture in the blender or not, and so on. Possibilities are endless. And that's exciting and all, but here I wanted to keep it simple and stick to one quality: I wanted it to be a nice substitute for plain water, not soft drinks. Something you can fix really quick, and drink in a large amount in place of water. These criteria ruled out recipes that call for sweeteners (other than fresh fruits), or special processes such as cooking the ingredients or pureeing in the blender. One I made along with the raspberry-rose-vanilla water was cucumber and mint water. I more or less used the recipe here (sans basil - but it would be nice too), but there are a number of recipes for cucumber water similar to this. I've been consuming quite a lot of cukes this summer simply by munching on them as a snack (or for hydration, really) but this cucumber-flavored water wasn't bad at all with a plenty of ice, and went nicely with meals. Cinnamon water. Which is, water infused with cinnamon stick(s), and that's it. Cinnamon is a very common ingredient to use in baking and to a degree in cooking, and I often use it to add flavor to my teas and even homemade liqueurs. But simply infusing water with cinnamon didn't necessarily come as a natural thing to do to me, so I was intrigued. I first saw the 'recipe' in the above-mentioned flavor water book, but you can find it on the Internet, including here. I ended up infusing the water for two full days, and it got quite potent. Which wasn't a problem though, as I could just dilute it with more water (and ice). We had it with a curry (Japanese!). Blueberry, watermelon, and white peach. Do you smell summer? I paired each fruit with different kinds of herb. Thus had peach sage water, watermelon rosemary water, and blueberry mint water. Fruits are local and in season, and herbs are from our little herb garden. The peach-sage combination was an idea I took from here. I used white peach rather than yellow because white varieties are what we have aplenty here. I also added a few slices of lemon in a hope to keep the water from turning brown. I was intrigued by the pairing of peach and sage as I'd never used them together; I imagine thyme or maybe lemon verbena would be nice too. The watermelon rosemary water was a recipe from the above-mentioned KISS flavored water post; I'd have thought pairing watermelon with mint, which would also work. As for the blueberry and mint one, I borrowed the idea of paring blackberry and mint again from here, and used blueberries in place of blackberries. This is blackberry lemon ginger water, the recipe of which I found here. I loved the idea of blackberry and ginger, though if I try it again I'd probably leave it to infuse for longer than specified ("at least an hour") and might use juice of fresh finger to give it a real strong ginger kick (I love ginger, see). Either way, filtered and served in a glass with some ice, these fruit and herb flavored waters made rather pretty drinks. And a few slices of steeping fruit added to the jar/glass didn't hurt either. I enjoyed them all, but I must admit that the peach-infused water wasn't as peachy as I'd hoped it would be. Although it was tinted in a pretty shade of pink, the lemon totally overpowered peach. Now I've found several recipes for peach flavored water, and most of them seem to require either cooking the peach in water, pureeing and sieving the infusion, or sweetening with some sugar - or all of the above. Here I wanted to try it without any of it, but next time I try making peach water I might go for some sweetened versions, for more a more pronounced peach flavor. Then again, here my focus was subtly and simplicity (as in the processes required to make, not the flavor), so it was okay. There are a lot of ideas for homemade flavored water, and other flavor combos I would like to try include shiso and sansho pepper (a Japanese cousin of Sichuan pepper) (from the Japanese flavor water book), pineapple and mint (another one of the KISS flavored waters), or even pineapple, chili and mint as featured in here, where you can find a bunch of other interesting flavor suggestions, such as cucumber and melon, and watermelon and basil. Homemade honey-sweetened ginger ale, anyone? This being a sweetened drink, it's different from all the other ones I've featured above. But is a favorite summer drink of mine, prepared with ice-called sparkling water. I've written how to make the ginger honey syrup before - though measurements may be different, as I basically measured my ingredients by eye this time. Basically, all you need to do is to combine thinly sliced (and blanched, if you like) fresh ginger root, slices of lemon, as well as some dried whole spices (chili peppers, cinnamon sticks, cloves, cardamom pods, and black peppercorns), and honey, and let it steep at least for a few days. Last time I made ginger ale with this honeyed ginger ale, I remember thinking that the flavor of honey was a bit too strong for the drink to taste like real 'ginger ale'. But here I was pleased to find my syrup was just right; no doubt the longer steeping time gave the syrup a more potent spice flavors to balance the things out. That being said, you can still start your batch of honey ginger syrup today and enjoy glasses of homemade ginger ale in a week. Or just make one of those easy flavored waters like I've done. And I will. After all, it's only for a short period of time that I crave for ice-called drinks - as long as I'm here in an area of Nagano where people usually come to escape from the heat. And I can see it's nearing its end, with a hint of autumn already in the air. These recipes are lovely, thank you for sharing it with us! What a lovely summer color in your pictures! Recipes are lovely and the way you present the recipes are just so inspiring. I agree, Tokyo is very hot, but it`s a very nice heat. Tasmania rarely gets this hot, so it`s a nice change! I am excited to see what Kyoto and Osaka will be like with the weather! Your blog is lovely and the drinks look delightful! So beautiful... I am making similar concoctions here in winter, only with hot water - pineapple sage; bay leaf and lemon rind; rosemary and lemon; cinnamon. Very restorative. Thanks for the new combinations. SophieDarling - hahaha you must be the first person ever to say tokyo heat is a "very nice heat"! ;) reckon kyoto and osaka are worse..? Alison Sampson - oh they all sound lovely! had a bay leaf & lemon rind infusion for the first time in sicily back in the spring and loved it. must make it myself too! Dried rose isn't really something I can get where I live, so would replacing that with some rose water work out? From what I understand it's usually just water infused with dried rose petals anyway.